Manufactured near Belfast, Northern Ireland, from 1981-1983, the DeLorean automobile was the brainchild of John DeLorean, who made his name in the automotive industry through his work at Packard, Pontiac, and Chevrolet from the 1950s through the 1970s. After leaving General Motors in 1974, he started the DeLorean Motor Company (DMC). DeLorean’s self-named sports car was the talk of the auto world long before it ever hit the streets as his radical coupe featured an unpainted, stainless steel body with exotic gull-wing doors. Mr. DeLorean was already himself an auto industry legend for designing one of the most definitive muscle cars, the Pontiac GTO. He was also known for his fast rise through the ranks at General Motors, where he gained a reputation as a rebellious visionary. The production version of his stainless car debuted in 1981 with mixed reviews, but by 1983 financial difficulties had doomed the company, and it closed down before building fewer than 10,000 cars. Who could have guessed that most people’s reference to the car would come from the movie “Back to The Future” and Doc’s “DeLorean converted to a time machine”? The exciting history of the man and the company aside, the car is actually quite novel, both then and now. Designed by ItalDesign’s Giorgetto Giugiaro, most of the engineering work was completed under the direction of Colin Chapman’s Lotus Cars in the United Kingdom. A “world car,” before the term came into being, components were supplied from Germany, France, England, Norway, Italy, Ireland, Scotland, Japan, and the U.S. The stainless steel body panels and gullwing doors were perhaps the most distinctive features of the car and surprisingly practical; the gullwing doors only required 14″ of side clearance to open, and the brushed stainless panels were to never rust. The DMC-12 was built on a Lotus designed chassis, which consists of a central box-section backbone and “Y” shaped sub-frames. The car’s body is constructed of glass-reinforced plastic, with Brushed Grade 304 stainless-steel panels attached. The panels are easily removed to repair any small dents and any minor scratches can be removed with light sanding. The DeLorean factory closed in early 1983 as a result of John DeLorean being unable to raise further capital to keep the company afloat after producing just over 9,000 cars. 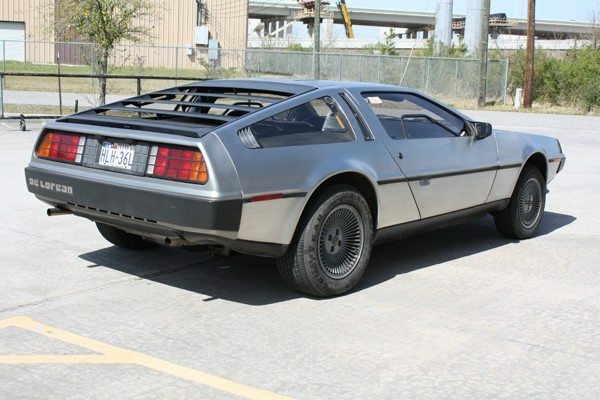 All the remaining stocks of parts for the DeLorean car were shipped to the States, and are now in the possession of DeLorean Motor Company (Texas), based in suburban Houston. 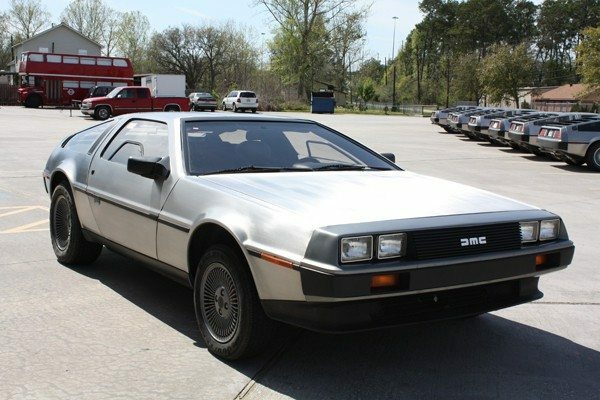 Though it has no connection to the John DeLorean’s original company, DMC (Texas) owns the rights to the name and logo, and through their five dealers in the U.S. and Europe, serve the needs of DeLorean owners and enthusiasts around the world. John DeLorean passed away in March of 2005 at age 80 from complications of a stroke. This DeLorean, built in May of 1981, is the 1,003rd car to come off the production line. As an earlier production car, it has the desireable “gas flap” hood and the original black leather interior. 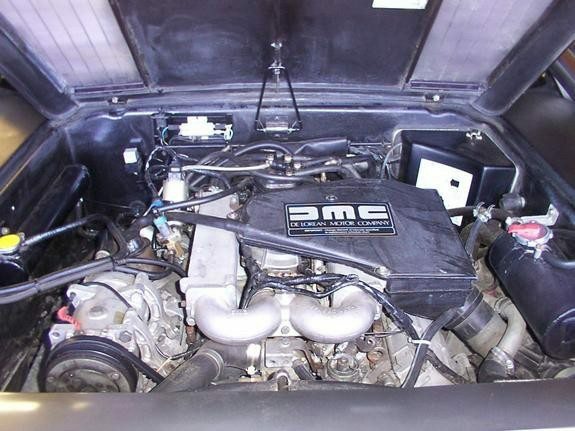 Fitted with a five-speed manual transmission, the engine is the original 2.8 liter all-aluminum V6 supplied to DeLorean by Peugeot/Renault/Volvo. All DeLorean cars came with four-wheel disc brakes, Bosch fuel injection, power windows, central locking, tilt/telescopic steering column, AM/FM/cassette stereo, intermittent wipers, remote side mirrors, air-conditioning, alloy wheels and full instrumentation.